Archery Talk A large archery chat/forum site . Archery GB The Archery GB website of (formerly the Grand National Archery Society) this Sports National Governing Body, use this to find a local archery club, and as a great source of information. The Grand National Archery Society was originally founded in 1861, at a meeting held at the Adelphi Hotel in Liverpool and will be celebrating its bi-centennial this year in 2011. BL-BS The British Long-Bow Society perpetuates the use of the traditional recreational Longbow for two-way Target and Clout shooting, by arranging Bow Meetings for its members throughout the British Isles. FITA The world body for archery recognised by the International Olympic Committee (IOC). FITA sets Laws and Bylaws particularly for competitions for target archery, field archery, ski archery, run archery, flight archery and clout archery. 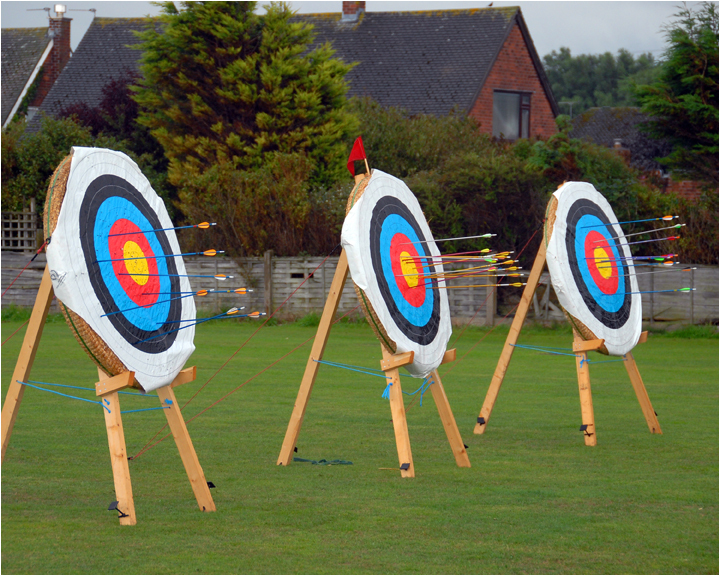 ableize Details of archery sports clubs and facilities for disabled and wheelchair users in the UK. NFAS exists to foster and promote Field Archery as a sport. All our courses are unmarked (i.e. unknown distances), usually situated in woodland, and our targets are predominantly 3D or paper animal faces. The 70m Internet Archery League The 70 Metre Internet Archery League is designed to enable individuals and teams of archers to judge how they are progressing, both locally and internationally. Recurve, compound, longbow & barebow archers are supported, as are individuals & teams of three. Archery Score Pad Enter your scores and see how you fare against the rest of the world. Horsing aboutHere is one about archery and horseback, something for us to try perhaps? Bow International Magazine A quarterly archery magazine. The Manchester Museum The collection of over 4,000 objects consists of archery material from all over the world. The nucleus of the Collection was donated in 1946 by Ingo Simon, a life-long researcher into the development of the bow, and a skilled and dedicated archer. Green Man Longbows Wow ! Some really beautiful Longbows for sale here. Well worth a look if you after some premium kit! Flybow is a well appointed archery supply retailer .It has a great stock especially if you are considering building you own bow.